Room was cleaned twice in one week, when we asked for more towels we were told 'no' in no uncertain terms! 'internet cafe' had no working internet, and the 3 times i ate in thee they got all 3 orders wrong! Pool has lots of tiles missing and is not heated. Colony of Cats wandering about stealing food. However....for a cheap week in the sun over new year, it was ok and you get what you pay for! Basic facilities but we ate out we were on holiday after all! Rooms were cleaned 6 out of 7 days, was a quiet resort but san blas a 5 minute taxi ride had restaraunts and entertainment on each evening around 5 euros in taxi. The resorts bar had kareoke 2 nights but closed at 12 so no problems there, staff were fine Pepe in the bar did a fine breakfast & coffee spoke good English & appreciated it when you spoke Spanish to him (or tried)! Pools were cleaned daily all amenities close by supermarket, laundry etc. Very pleased with size of apartment which was newly decorated and well equipped. Excellent view over golf course and sea. Had stayed here before 3 years ago and thought it no better than adequate, but a lot of improvements made, provided you avoid the buffet. Don't bother with TV - live sport shown in hotel bars. Complex was clean, staff helpful, aircraft noise intermittent but not really a problem as some make out. Location great for resort and taxis. Measured less than 10 minutes walk to beach which is very quiet. No entertainment, but that's what we wanted - good to get off and explore at night! We stayed in this hotel by accident as we were meant to be else where but on arrival our room wasn\'t ready so we were moved to Green Park. I have stayed in the area on quite a few occasions and really was very upset about being moved here. When we arrived I was very surprised by how clean and nice the reception was, and when we got to our room it was so much better than I expected it to be. Very clean and very spacious. The staff couldn\'t be faulted, so helpful and friendly. We were meant to move and go to the place that we had originally booked, which incidently was more expensive, and we decided to stay put. Must admit the staff were quite shocked by this. Overall I have stayed in worse places for much more money. If you want somewhere thats cheap but clean then stay here. I would have no problem staying here again. The only fault was with 2 english families that had travelled out together whose children caused problems round the pool and both the children and adults ended up have a full scale punch-up before drowning their sorrows in the bar. This was no fault of the hotel and we were ashamed that it was the English showing themselves up yet again! There was no maid for the whole 2 weeks even though we asked several times. We arrived to be put in a room that hadnt been cleaned. Disgusting the whole holiday. This hotel is directly below the flight path, planes fly over without a break 24 hours a day. You cannot open the balcony doors due to the noise hence the room is very warm as there is no air conditioning. The facilities and utensils for cooking make it near impossible to cook anything. We could not wash in the sink as the water was barely a dribble, we had to bath or shower. There were 3 pools but only the largest was usable as the other 2 were not cleaned of leaves, etc that had blown into them. There was no entertainment at the hotel what so ever and the bar was only busy, happy hour from 6 = 7. Room reasonably clean and staff friendly. 15 euros a week for the safe with 10 euros deposit, and something the same for the small portable TV which only showed Spanish and German channels apart from CNN news and eurosport. Beds and sofa bed extremely uncomfortable, I could not wait to come home. Hotel under flight pass you soon get used to it hotel staff and security very friendly treat them like you want to be treated room ok cleaned 4 times aweek for me exta towels when I wanted them. Do not bother with telly it costs you and there is nothing worth looking at. cooking not to clever, no kettle use sauspan, turn grill one click for full heat. Can not cook did not worry me swiming pools lovely clean as surrounding areas. Shooting and archary at 12 oclock if you want it. No entertainment in hotel but bars and pubs all around and karioke in the bar opposite hotel 3 times a week. I would go to this hotel again you get what you pay for just go there and enyoy yourself. My husband and I stayed here for a week. 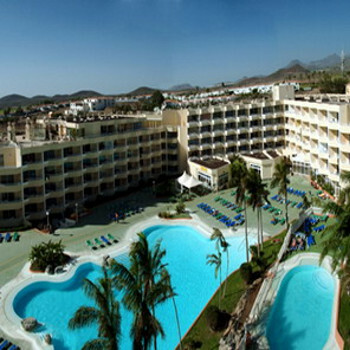 We booked it because it was cheap, we were in Tenerife on business. Our first impressions when we arrived was that it looked OK, nice reception area. We arrived in our studio which was surprisingly big, however there were tiles coming off in the bathroom, the sofa bed was very uncomfortable (you could feel the wooden slats under the seat when you sat down). The beds were two single camp beds, not very comfortable. The maids came in 3 times in the week and straightened the beds but did no cleaning that we could see. There was chewing gum stuck to the underneath of the bedside table. The corridors were not cleaned in the week we were there. We complained a few nights about the noise from some of the apartments. Other guests didn't seem to have any consideration for other people and insisted on shouting and slamming doors in the middle of the night. Don't pay for the TV unless you can speak German or Spanish or like watching the news or cartoon network all day and night. The location is a bit out of the way, about half hour walk to the San Blas centre which has some nice bars and restaurants. Green Park is directly under the flight path and the noise from incoming planes is deafening. All in all i would not stay here again. As it happens we were out from 9.30am till 7pm most days (sometimes because we couldn't face going back any earlier) but I would definitely not choose this accommodation for a main family holiday. I would also suggest hiring a car to get around as taxis could get a bit pricey. Theres not an awful lot to do in the Golf Del Sur unless of course you like golf!!!! Before we arrived we requested ground floor due to having a very outgoing toddler, we were then put on the third floor!! We were given a courtesy room every evening for showers which were filthy, no shower curtain, towels and water all over bathroom floor from guests before. Not hygeinic for us let alone a 20 month baby!!! The swimming pool was disgusting we did not dare get in !! The reception did not have a clue what they were doing and very rude! !